The Palo Duro Canyon is located just several miles south of Amarillo, Texas. If you are going to Amarillo, make sure to read our other post; A Perfect Day in Amarillo. The Palo Duro Canyon is the second largest canyon in the nation after the Grand Canyon. For you Texas newbies, I have a little advice for you: Texas summer + Canyon = HOT. I couldn’t believe how fast we got caught by the Texas heat. Make sure to plan a hike here for the first thing in the morning. Hike the canyon by descending 800 feet below the rim while you descend through 250 million years of geologic history. Day trippers can stop at the visitors center on the rim of the canyon or the Trading Post on the canyon floor. We drove the loop around the park and stopped at a few different points of interest. The morning we went was stormy which made the beautiful landscape even more dramatic. We loved the drive and the random Longhorns that would sit and watch the cars drive by on the side of the road. As you near the park, the canyon will eerily appear on your right side. When you first see the canyon, look out for zip line adventures a. If you aren’t into ziplining, just continue your drive on Park Road 5. After paying a small fee to enter the park, the road will wind down into the bottom of the canyon where you can drive in your air conditioned comfort of your car, but not before taking in some fantastic views on the way down. Toward the far end of the park, we saw a cave and decided to get out and explore. The rain made the clay floor of the canyon very slippery and messy but we still got to see some beautiful parts of the park. It is hard to explain how vibrant the canyon is. The colors of the brush and the various layers of rock and clay are unexpectedly bright. One of my favorite travel bloggers, Ireland Family Vacations, recommended hiking the Lighthouse Trail. It is obvious why this is one of the most photographed parts of the park. 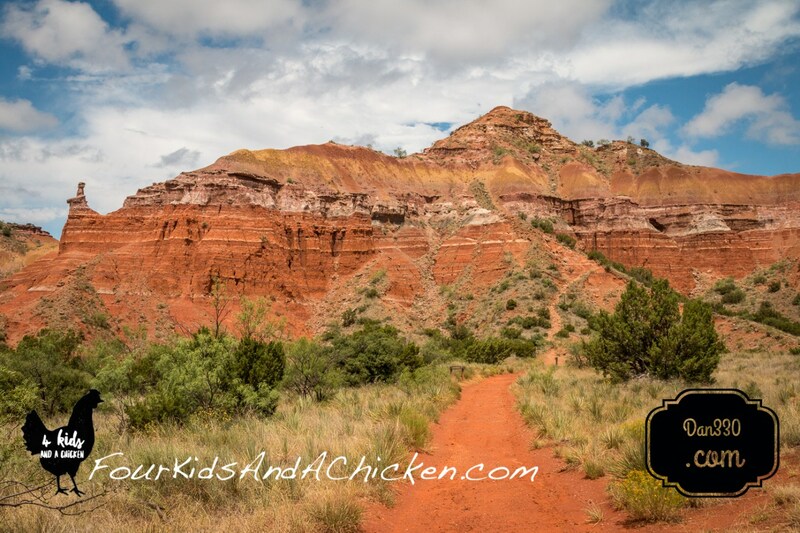 The hike itself is nearly 6 miles long and leads you to the Palo Duro Lighthouse rock formation. The hike is not hard. The heat and humidity might kill you though. We got here after the storms blew through and the fresh rain and hot blazing sun nearly cooked me. The hike starts in a low area with a lot of shrubs. We saw plenty of pretty plants and even a few lizards. The trail gradually rose and we were walking across the brightly colored orange clay of the park toward Capitol Peak, shown below. The trail follows this hill around the right-hand side and then continues up to the lighthouse rock formation. The hike just got too hot for us. We decided to spend the precious little time we had back in other parts of Amarillo. We left the park but not after enjoying some more of the plants that somehow survive this place. There is a lot more to see in Amarillo, including Route 66, the Cadillac Ranch, and the Big Texan. You’ll have to learn more about those in our future posts. But make sure Amarillo is part of your Texas road trip.